Wow, what a book. As I was reading I kept thinking that Whiteout would make a fantastic Christmas drama and I can’t believe that I have only just discovered this series. This is a brilliant novel from Ragnar Jonasson which I highly recommend. Once you start reading this book, you won’t be able to stop; it held me captive from the first to the last page. 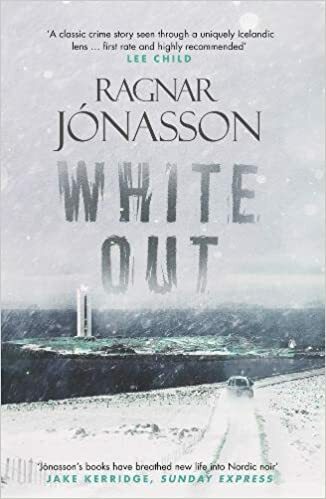 In Whiteout, detectives Ari Thór and his former work partner, Tómas are investigating the case of the suspicious death of a woman who is found dead at the bottom of the cliffs in Kálfshamarvík in the run up to Christmas. On hand it looks as though the woman has committed suicide, but the two detectives begin to suspect that something more sinister may have occurred. This isn’t the only death to occur in the woman’s family. Her mother and her sister were also found dead, suspected to have thrown themselves off the cliffs years before. This is what Ari Thór finds intriguing about the case and so he begins to believe that there may be more going on here than meets the eye. After reading my first Ragnar Jonasson thriller, I can definitely label myself a fan. I have a lot of catching up to do on the rest of the Dark Iceland series which I have bumped up to the top of my pile. I really liked Ragnar’s writing style which is brilliantly translated by Quentin Bates; it does have an Agatha Christie element to it which would make this book perfect to sink in to by a roaring fire, if you haven’t got any plans for Christmas Eve, this book would be perfect to keep you company. I loved the setting of the old house, set in the middle of nowhere, the lighthouse and the cliffs gave the book a very sinister feel and also a sense of foreboding. Although the book takes place in the modern world it gave the sense that they were cut off from the rest of civilisation. This did brilliantly in adding to the tension of the novel, especially as I tried to work out who the culprit was, and if they were amongst the people who were staying the house. I can’t wait to read more from Ragnar Jonasson and I’m looking forward to catching up on the rest of the Dark Iceland series. Thank you to Anne Cater for inviting me to take part in the blog tour and to Karen Sullivan at Orenda Books for sending me a copy of the book to review.